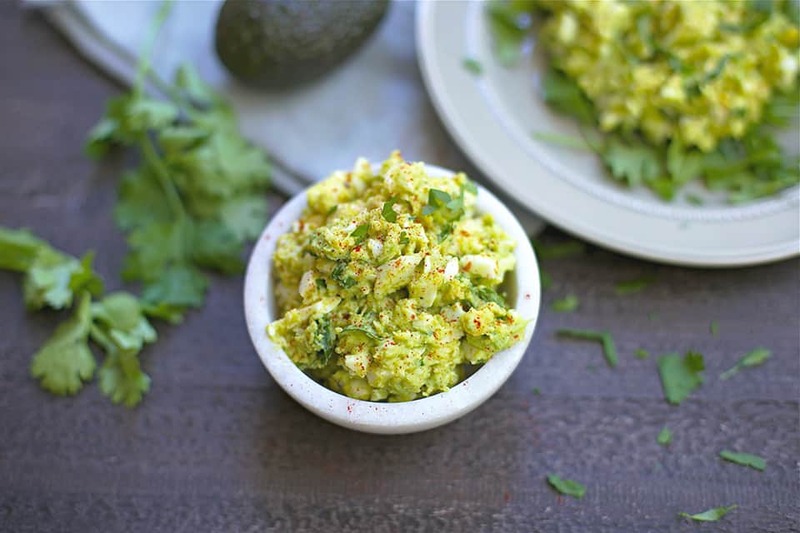 You’ll love this variation of the classic egg salad that is mayo free! 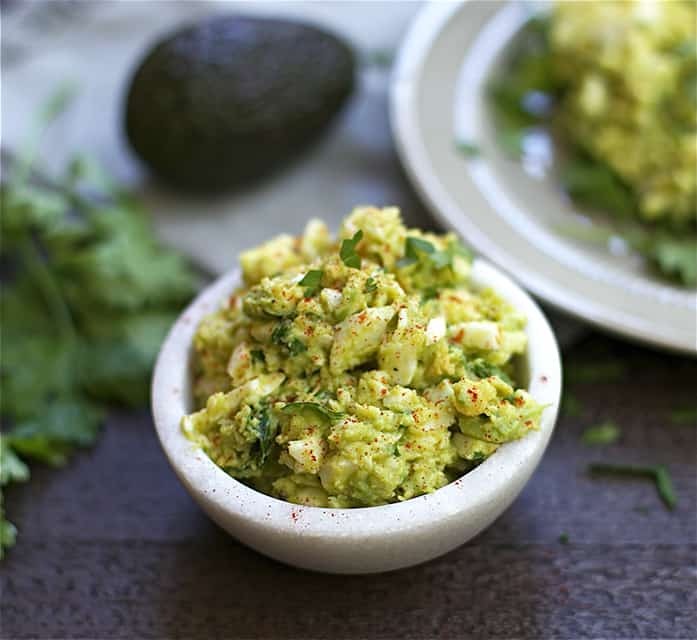 Full of healthy ingredients, and oh so tasty with avocado and cilantro! With Easter just around the corner, I know you may have some use for some hard boiled eggs! I love deviled eggs, egg salad, and just slicing eggs on top of my regular salads. 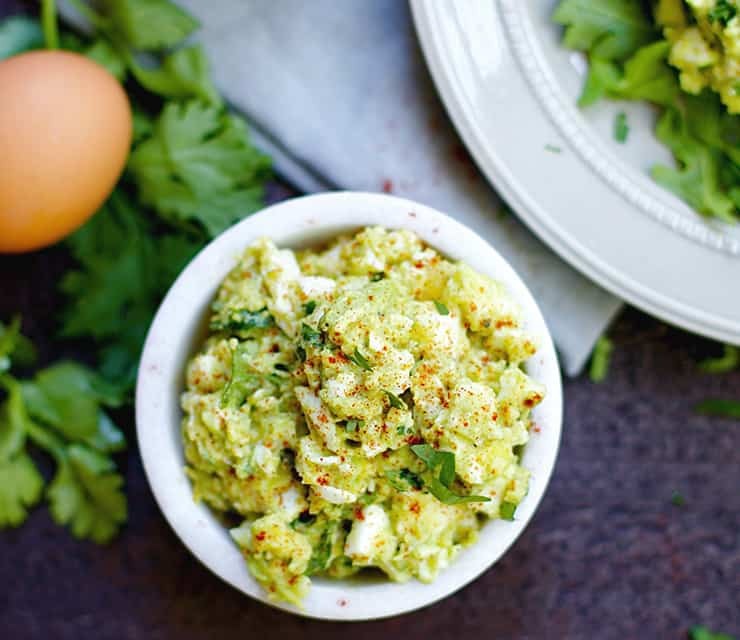 But today, I am sharing with you a twist on a childhood classic: egg salad. But this one is waaaaaaaaaay better! Have I told you lately how much I hate mayonnaise? It is actually the one of the only foods I have refused to eat since I was a child. I have no idea why, but just role with it. 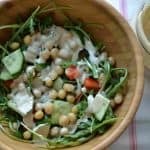 Salads with mayo have always been an issue for me; I can’t eat them! Even egg salad. I remember liking it as a kid, and then quickly discovering that it contained mayo, and that was it. I needed a new replacement! My mom used to mash up hard boiled eggs with avocado for me and add in salt and pepper. It was tasty, but still not my favorite. So insert some avocado, cilantro, lime juice, cumin, and salt. 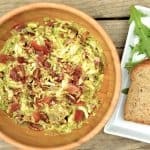 With this combo of ingredients, traditional egg salad is flipped on its side! 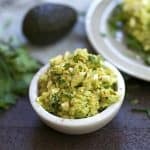 I love it, it almost tastes like guacamole egg salad. Which I could just shovel in my mouth all day long! Serve in a wrap, in bread, or over greens for a tasty lunch. Place your eggs in a large pot. Cover with cold water (this helps to prevent cracking). Heat to a boil, then turn heat off and cover with a lid. Let sit for 15 minutes. Remove eggs, and let sit in cold water for another few minutes. You can store your eggs hard boiled with shell on at this point. When ready to make your egg salad crack the eggs and start peeling from the bottom (rounder side). Mash your eggs with a fork or pastry knife. Set aside. In another bowl, mash your avocados. Add in lime juice, spices, and salt. Slowly fold in to the egg mixture, continuing to mix. 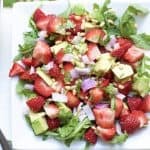 Sprinkle with cilantro when ready to serve. 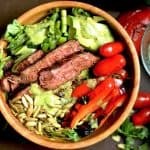 Serve over bread, salad, or in a wrap.